For all non-emergencies, incidents, reports, and administrative questions call 303-441-4444. 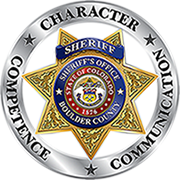 Please consult the following directory for contact information for the Boulder County Sheriff’s Office. Our Organizational chart, and Command Staff Contact Information contacts are also available. Services We offer many services to the public including: fingerprinting, concealed weapons permits, burn permits, public records, civil process, and emergency notification registration.